LONDON -- A group of Paris Saint-Germain supporters in possession of weapons and drugs were turned away by police after allegedly causing damage to Kingsmeadow stadium prior to their club's Champions League quarterfinal first-leg clash with Chelsea Women. Around 45 police officers were dispatched to the stadium in response to reports of criminal damage caused by the group of 50 or so PSG fans, who arrived at the vicinity of Kingsmeadow. A search of the group's coach uncovered weapons including a knuckleduster and knives as well as drugs on board and they are expected to be sent back to France. A statement from the Metropolitan police read: "At approximately 08:00hrs on Thursday, 21 March police were called to reports of a group of Paris St Germain (PSG) supporters causing criminal damage at Kingsmeadow Stadium in Kingston. "Officers attended but all those involved had left the scene. "Later in the day, officers were made aware of sporadic instances of disorder involving PSG supporters at both Waterloo and Wimbledon stations. "Those involved were identified and when they attended Kingsmeadow Stadium this evening they were stopped. A coach they travelled in was searched and weapons, including knives and knuckle dusters, were recovered along with class A drugs. "One man from the coach was arrested for possession of class A drugs and the remaining passengers were escorted from the area by police. Enquiries continue." PSG have contested claims the stadium damage was caused by their supporters. A Chelsea spokesman told ESPN FC: "There was a minor incident involving visiting PSG fans before the match but it was quickly handled by the police." 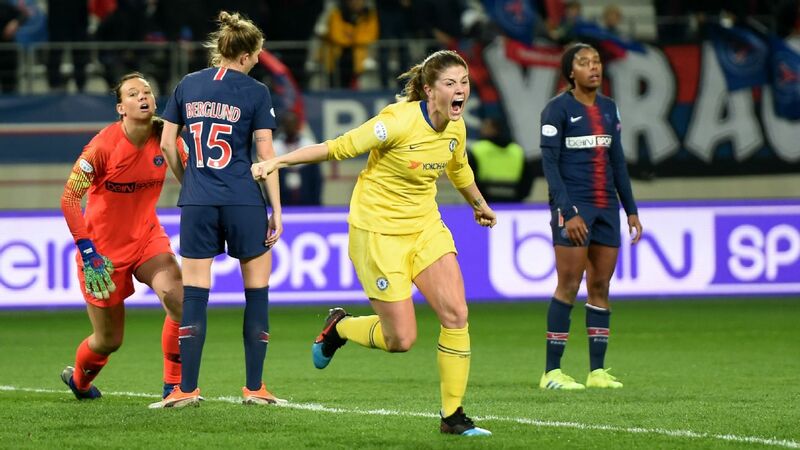 The Chelsea Women went on to win the first leg 2-0 with second-half goals from Hannah Blundell and Erin Cuthbert, with the second leg set for March 27 in Paris.